During the late 1960s, the armies of the Warsaw Pact started adopting a new type of military vehicle – the infantry fighting vehicle (IFV). The design of an IFV lies somewhere between a tank and an armored personnel carrier (APC). Like an APC, it is equipped to carry infantry into battle, but unlike an APC it is also equipped to serve as a fighting vehicle in its own right, with suitable armor and a main weapon such as an automatic cannon, medium-velocity gun, or rocket launcher. This makes an IFV less effective than a tank in combat, but more mobile. Although there was a precedent for such vehicles in the West German army, they were not widely used when the Warsaw Pact adopted them. 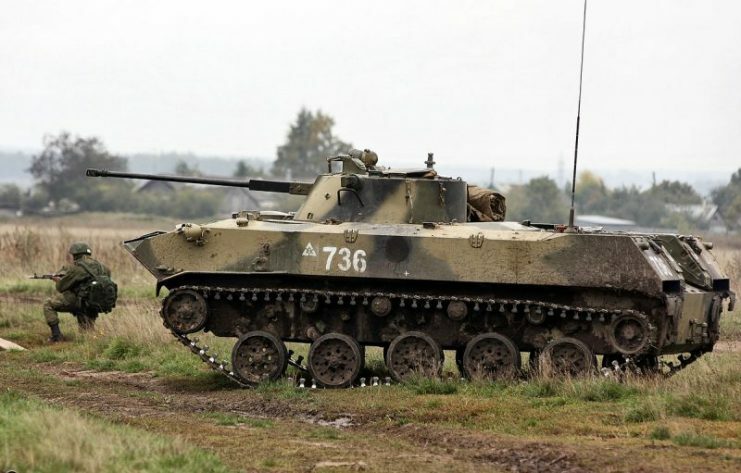 This initially gave the Soviets a tool not generally used in the west, though NATO countries would go on to adopt IFVs over the decades that followed. From then until its collapse in the late 1980s, the Warsaw Pact fielded a number of IFV designs. The first Soviet IFV was the BMP-1. It was first publicly displayed during a parade in 1967 but was not put into mass production until 1970. This innovative vehicle came equipped with a wide range of weaponry – a 73m 2A28 smoothbore gun, an AT-3 Sagger anti-tank guided missile launcher, and a 7.62mm PKT machine gun. There were also firing ports in the sides of the vehicle, so that infantry could shoot out while mounted. The vehicle itself had only two crew, a driver and a gunner, but it also had space for a nine-man infantry section, including a seat for the commander, who was in charge of the vehicle. The infantry could fire from inside or dismount through rear doors and roof hatches. 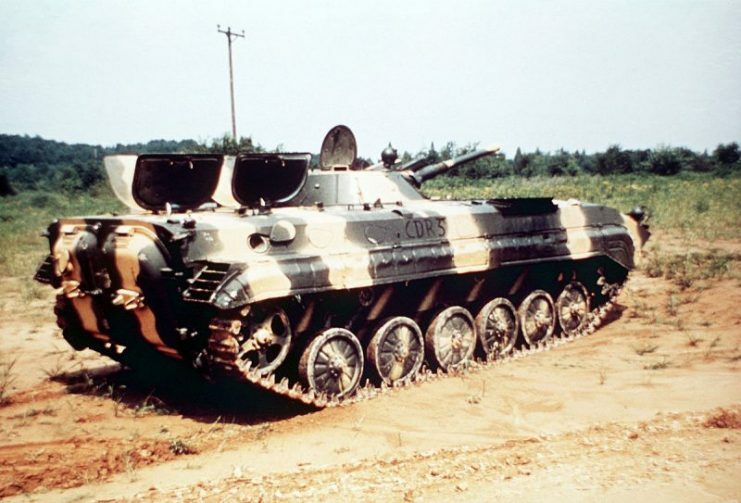 Introduced in 1980, the BMP-2 was similar to the BMP-1 but with a more heavily armored chassis. Like its predecessor, it had full nuclear, chemical, and biological (NBC) protection, as well as infrared equipment and amphibious capability. Like the BMP-1, this vehicle was equipped with a PKT machine-gun and a rocket launcher. Its main weapon was a 30mm 2A42 automatic cannon, which could be elevated enough to target enemies on high ground and even helicopters. A larger turret meant slightly less space in the vehicle, and so the complement of infantrymen was reduced to seven plus the commander. Developed late in the Cold War, the BMP-3 joined the Soviet army in 1990, just as the world was changing. The BMP-3 kept many important features from its predecessors, including smoke launchers and NBC protection. Its amphibious abilities were improved, with water jets replacing a system driven by the vehicle’s tracks. The armament was upgraded, with a 2A70 100mm rifled gun, a 2A72 30mm cannon, and three 7.62mm PKT machine-guns. The main guns had an elevation of up to +60°, again allowing it to shoot at raised targets. Appearing in 1969, the BMD-1 beat the BMP-1 into widespread service. This was a more daring vehicle, an air-portable IFV which could be transported by plane or helicopter and parachuted into combat zones. The crew initially parachuted separately from the vehicle, but this changed during the 1970s so that the vehicle would land with its driver and gunner onboard. The BMD-1 had the same turret and weaponry as the BMP-1, but with two extra machine-guns. It shared much of its grounded cousin’s other equipment, including infrared lights, and had a jet-powered amphibious movement system. Apart from the two-man crew, the BMD-1 carried five passengers. There were no rear doors, so they had to disembark through roof hatches. 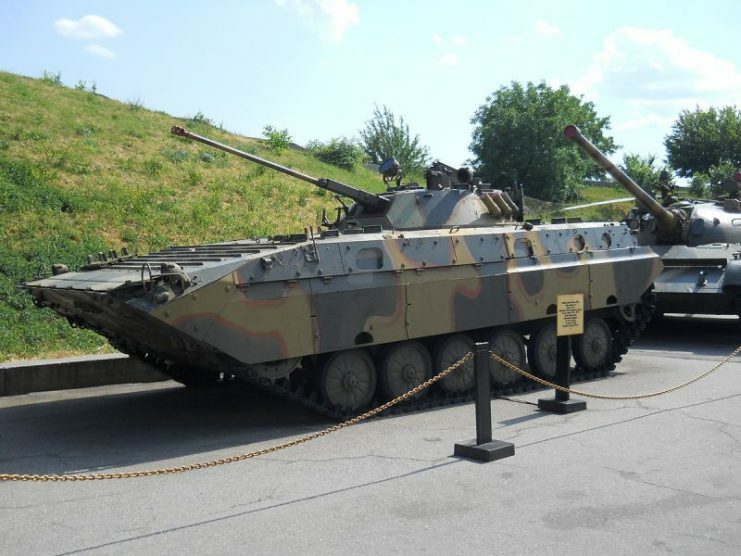 The BMD-2 was prototyped in 1985 and went into production four years later. Like its predecessor, it could be air-dropped into a combat zone and was fully amphibious. It also shared the NBC protection of other Soviet IFVs. The BMD-2 had one less machine-gun than the BMD-1 but made up for this with its improved turret. This carried a stabilized 2A42 automatic cannon capable of targeting helicopters and ground forces. A mount on the roof of the turret carried a missile launcher which could be detached for separate use. Entering service a year later, the BMD-3 combined the BMD-2’s turret with a new aluminum-armored hull. It was used by airborne and later naval infantry units. One of the most interesting innovations for the BMD-3 was the rearranged seating for the driver and two front gunners drawn from the infantry contingent. This was suspended from the ceiling, improving their chances of surviving an anti-tank mine. The BMD-3 added a grenade launcher to the previous weapons load and changed one of its machine-guns to a lighter model. These new weapons could be removed for use by the dismounted infantry. 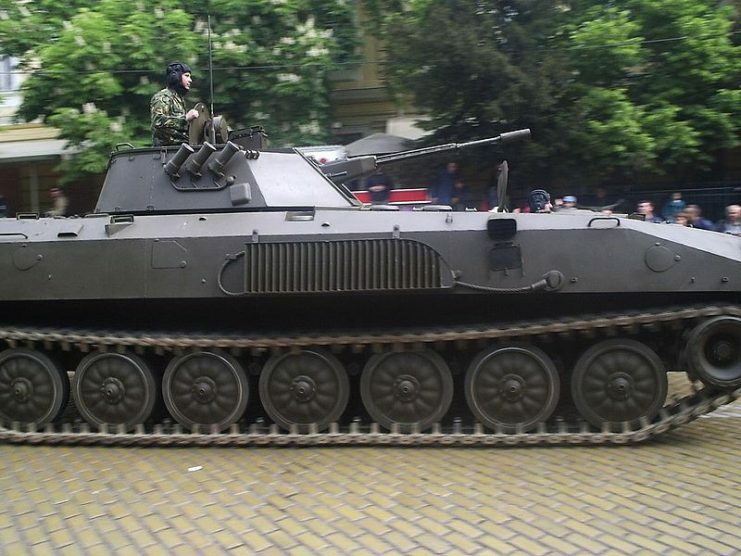 The Bulgarian BMP-23 was not based on its Soviet cousins but on another Russian vehicle, the MT-LB APC. A turret behind the engine carried an unstabilized 23mm cannon and a 7.62mm PKT machine-gun. There was also a missile launcher on the turret’s roof. 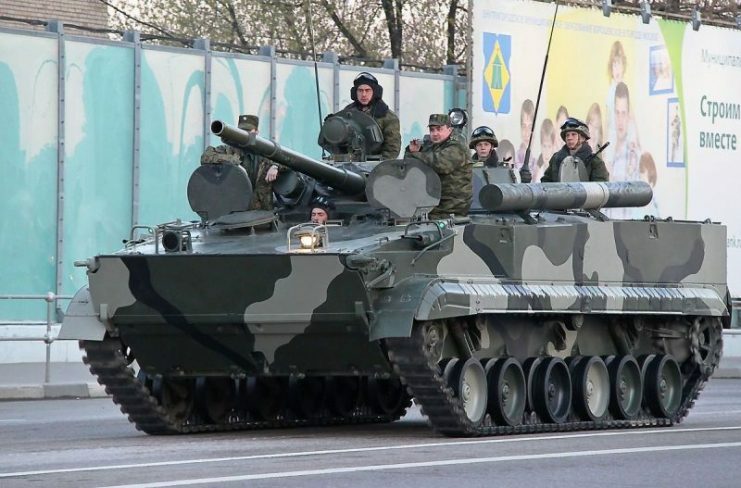 As well as the crew and commander, the BMP-23 could carry eight infantrymen. This vehicle could operate amphibiously using its tracks. It had to be prepared beforehand, with the periscope switched out, a trim vane erected, and bilge pumps switched on. 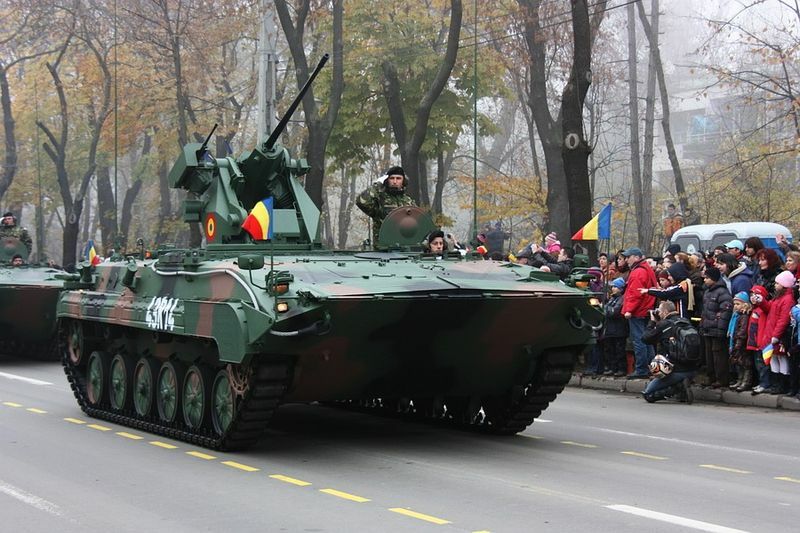 Romania’s contribution to this type of vehicle was the MLI-84. 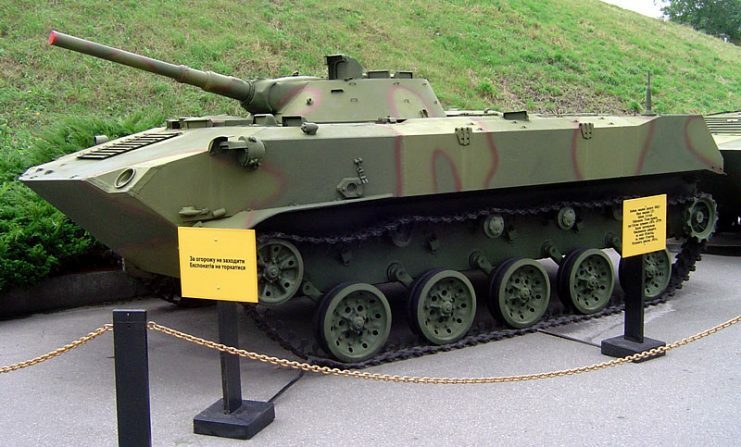 Its design was similar to the BMP-1 but heavier and larger. 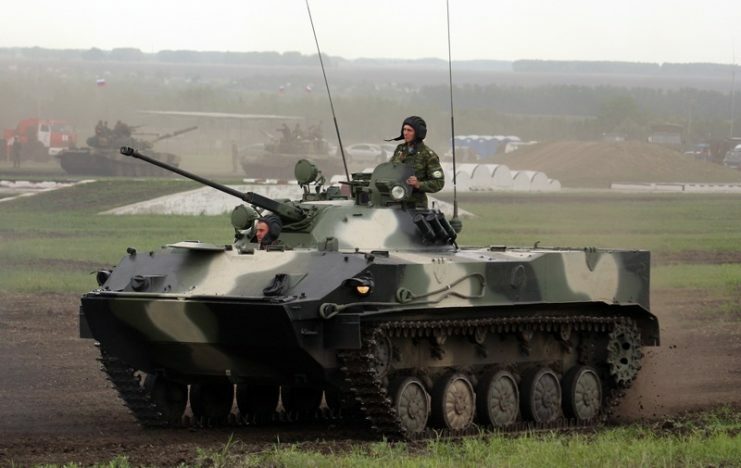 As well as the BMP-1’s regular weapon, it carried a 12.7mm DShKM anti-aircraft machine-gun. 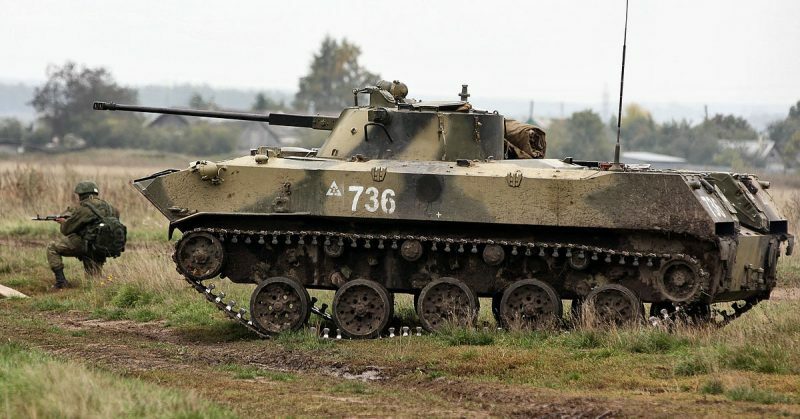 Despite its larger size, it carried the same complement of men as the BMP-1 – two crew and nine passengers, including the commander. Russell Phillips (2017), Tanks and Combat Vehicles of the Warsaw Pact.